After spending a successful spring break in Orlando, the women’s and men’s tennis teams are back in Middletown. 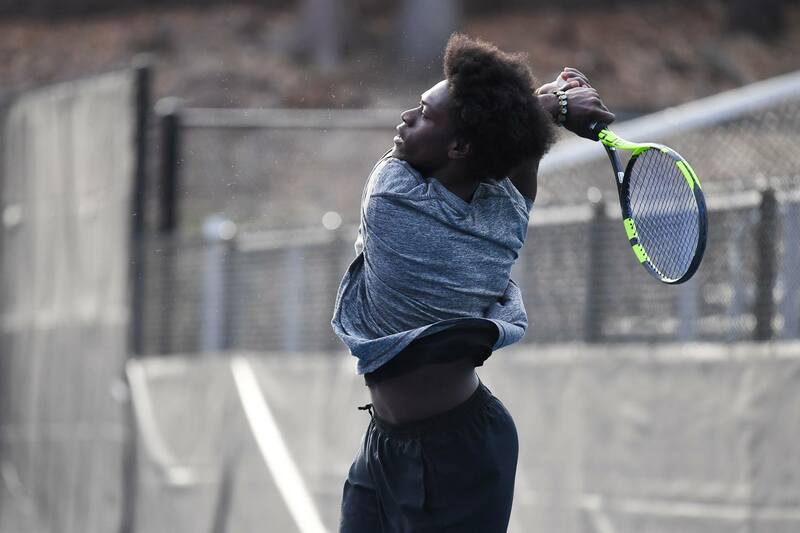 Both teams dominated the competition over spring break, with the seventh-ranked men’s team going 5-0 and the sixth-ranked women’s team winning four out of five of their matches, falling only to No. 1 Emory. “It was great to see the teams really come together as a family, buy in, and connect and compete with such heart,” head coach Mike Fried said of the Florida trip. Impressively, the Cards have maintained their momentum since the break. Since their return to the Northeast, the women have claimed wins over Wilkes University, Conn. College, Bowdoin, and Tufts. The men have also performed well, beating six out of eight of their opponents. Even in matches where the teams did not come out with victories, the players have demonstrated immense persistence in every match. After returning from Florida, the men’s team suffered a tough 4-5 loss to sixth-ranked Claremont-Mudd-Scripps in its first home match of the season. The California team claimed three singles wins and two doubles wins, sealing its victory. Despite this loss, the Cards featured standout performances from number one doubles team Adrian Roji ’21 and Noah Lilienthal ’22, who cruised through with an 8-3 win. Roji and Lilienthal also showed their abilities in singles, as both won tight matches at third and and fourth on the singles ladder, respectively. The Cards recovered quickly from this defeat, obliterating both Wheaton College and Wilkes with consecutive 9-0 wins. During the Wheaton match, first-year Max Lee earned his first career win as a Cardinal at number six singles. Against Wilkes University, Roji and Ali Mooraj ’21 won both their singles and doubles matches. These successes solidified the Cardinals’ ability to bounce back from a loss. The team continued its winning streak against Conn. College the next week, sailing past the Camels in an 8-1 victory. During this match, Peter Anker ’22 came out with a solid 6-1, 6-0 win at first singles, showcasing his ability to stick through long points and hit lots of balls. At second singles, Princeton Carter ’20 moved up the lineup and showed that he earned his spot, as he handily beat his opponent 6-2, 6-0. Next, the Red and Black faced fifth-ranked Bowdoin. The matchup against the Polar Bears proved to be a difficult one for the Cards, as Bowdoin ultimately showed its prowess by winning 6-3. However, the battle was well-fought by the Cardinals, who claimed the second doubles position and the fourth and fifth singles positions. Wesleyan had to bounce back from this loss quickly, since it was scheduled to face Tufts the following day. Again, the team showed its stamina and determination by battling their way through seven and a half hours of tennis and ultimately taking the win in a close 5-4 thriller. Last weekend was perhaps the most exciting match yet for the Cardinals. The team faced off against No. 2 Middlebury, and the difference in ranking did not seem to faze them, as the squad gracefully fought its way to an impressive 6-3 upset. This was the tenth win of the season for the Cards, already surpassing last season’s total of nine. It was Roji who sealed the win for Wesleyan—he came back after being a set down to win the match 2-6, 6-1, 6-4. This most recent match suggests that the future is bright for the Red Birds, who will host NESCAC rival Williams next weekend. “I think the key factors heading into the homestretch of the season are staying healthy and fresh, the teams taking great pride and confidence in the work they’ve put in, and everyone just enjoying the ride and the opportunity to compete for each other and for Wes at such a high level,” Fried said. The women’s team displayed similar skill over the course of its season. After returning from Florida, the Cardinals faced Wilkes University for their first home match. The team wasted no time in establishing its power, with every match ending in a decisive, straight-set win for Wesleyan. After this comprehensive win, the Red and Black played Conn. College in the first match of the NESCAC portion of the season. Again, the Cardinals showed complete control and were unwavering. Due to academic obligations, new doubles teams were put together. First-time partners Victoria Yu ’19 and Alexis Almy ’22 and Daniela Alvarez ’21 and Megan Tran ’22 worked seamlessly together to claim 8-2 and 8-3 wins, respectively. All six singles played their way to comprehensive wins in a match demonstrated the adaptability and depth of the women’s team. After these two pivotal wins, the team faced Bowdoin, which proved to be a bit more of a challenge than its previous two matches. However, the Cards did not waver and instead won their third match in a row, this time 6-3. That day, the number one and two singles were particularly impressive. Venia Yeung ’22 showed major determination at second singles, sailing her way to a 6-2, 6-0 win. At number one, Yu demonstrated incredible tenacity and endurance as she managed to score a hard-fought 6-4, 6-4 win. A fast turnaround came for the Cardinals, who faced No. 7 Tufts the following day. Despite the battle the day before, the team was fresh and energized and came home with a 5-1 victory. 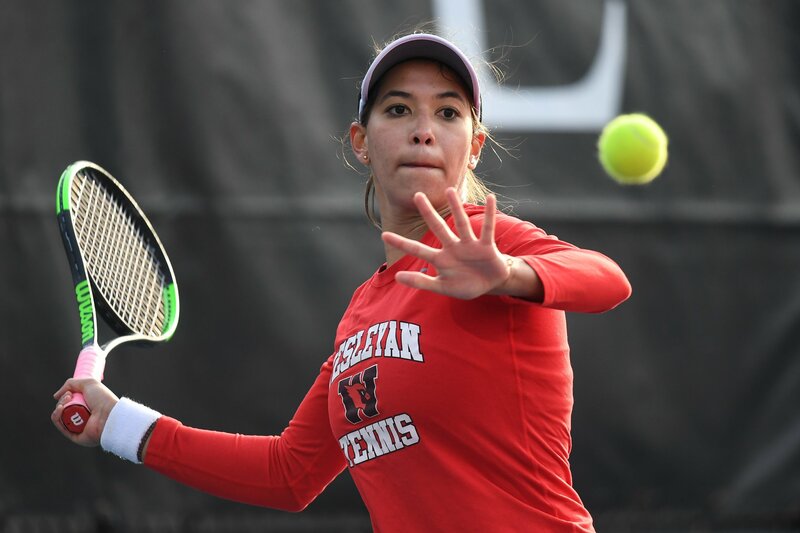 At first singles, Yu determined the win for Wesleyan during her remarkable 6-2, 6-4 win. Although the Red and Black fell in a tough 5-4 loss to Middlebury last weekend, the team did not give up and showed its resilience on the court with some extraordinary performances and comebacks. Almy was the star of the day, scoring wins in both her singles and doubles matches and showing astounding grit in both an 8-6 victory alongside doubles partner Alissa Nakamoto ’21 and in a thrilling 4-6, 6-4, 1-0(2) win in her singles match. Annie Roach can be reached at aroach@wesleyan.edu.